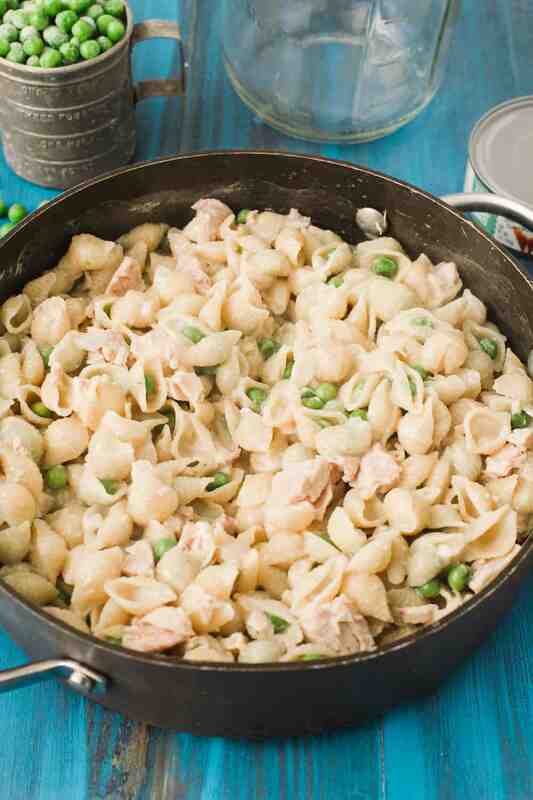 Home / Recipes / Dinner / Lightened Up Tuna Pasta Recipe Everyone Will Love! 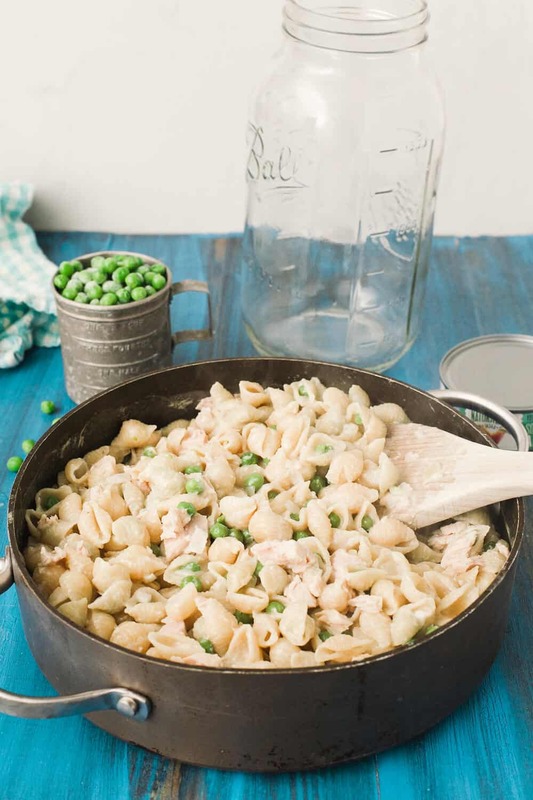 This lightened up tuna pasta recipe is creamy and delicious without the guilt! 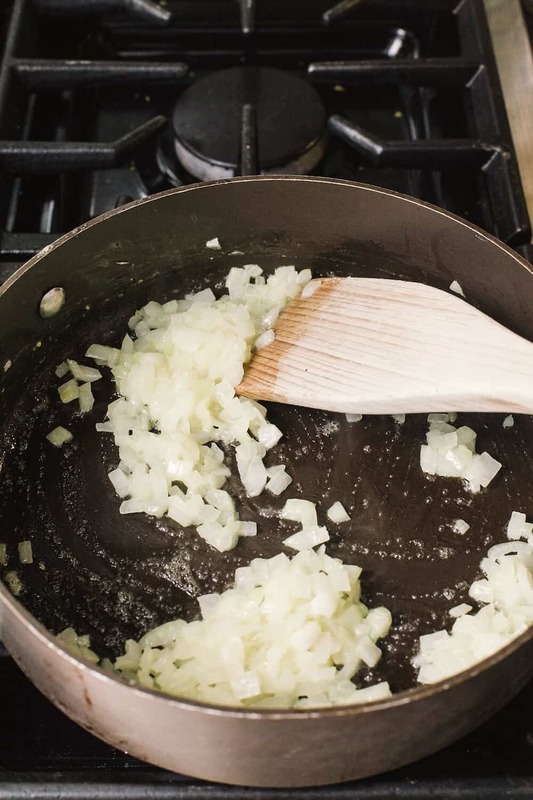 Plus it uses one skillet so clean up is a breeze. 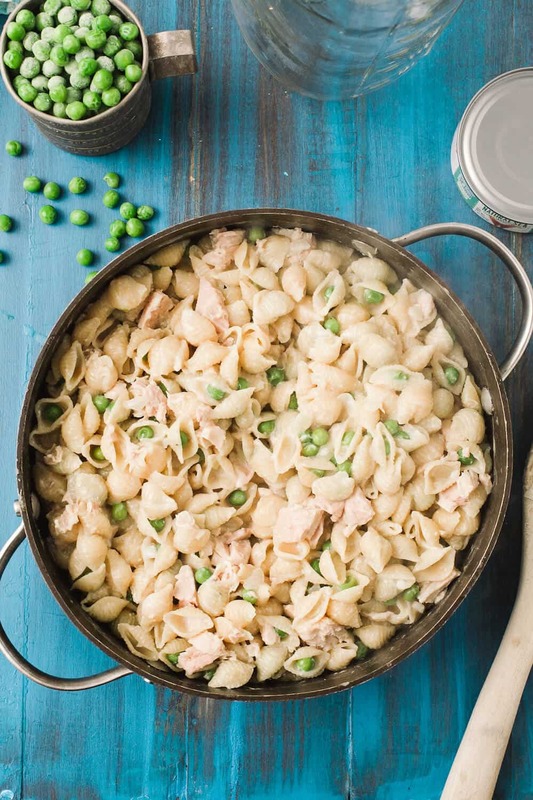 Are you craving a tuna pasta recipe that is tasty but light? 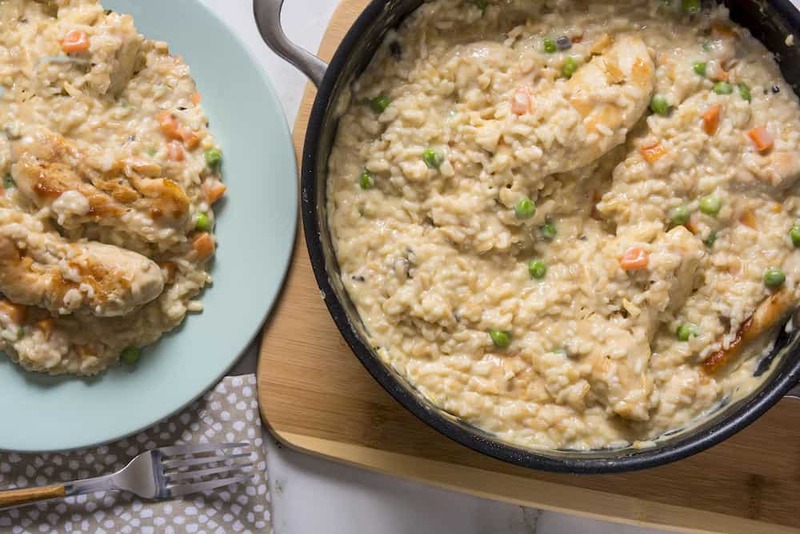 Don’t you just love a dinner that is crazy-simple to prepare, even crazier-simple to clean up, and lightens up a comforting, creamy, classic? 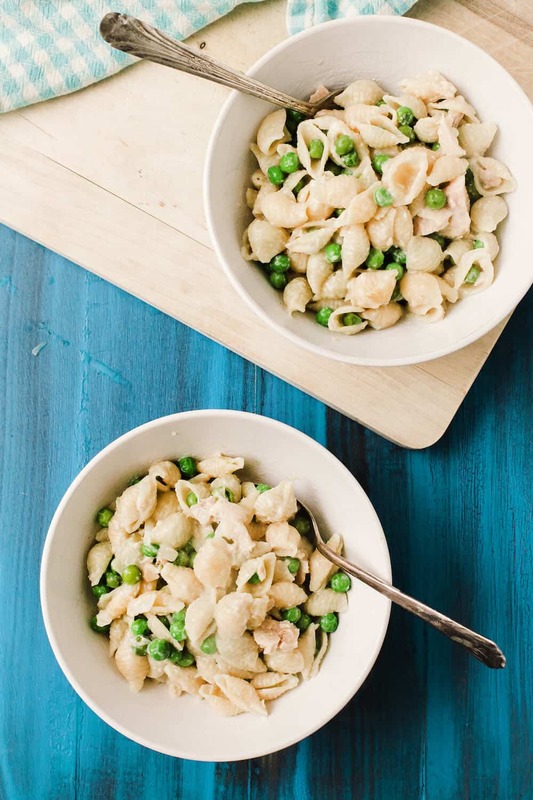 For me the answer to both these questions is yes, which is why this one-skillet, pretty quick, delicious creamy tuna pasta skillet is on regular rotation at my house. 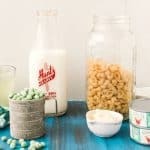 My favorite thing about this recipe is how creamy it is, despite the fact that it’s lighter in calories. It’s satisfying and also delicious. Here are a few more details! 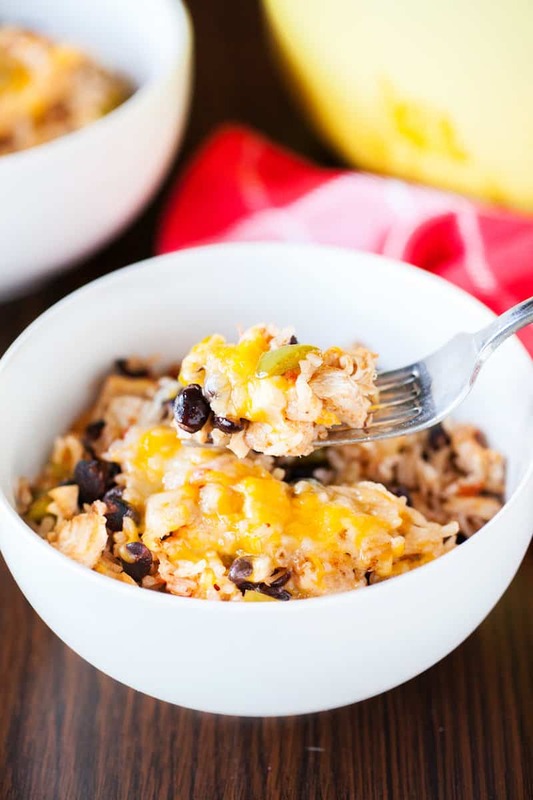 One thing I love about this recipe is that it’s creamy and delicious, but friendly if you are watching your weight. 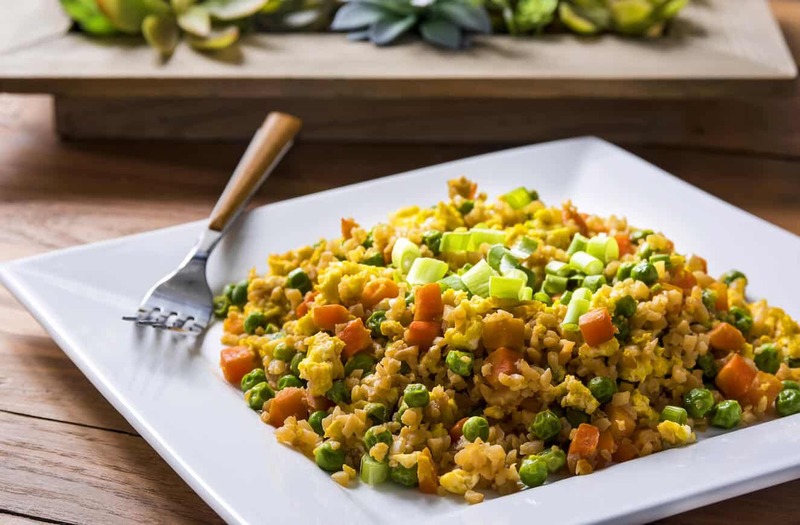 Specifically I love the Weight Watchers Freestyle program, and this recipe is only 5 points per serving! If you are still on Smart Points, this is 8 points per serving. Remember that the tuna, onion, and green peas are all zero points on Freestyle, and the vegetable broth is only one point. Even if you aren’t on Weight Watchers but are just watching your weight, this is an amazingly low calorie meal. Barilla pasta is my absolute favorite. I don’t get paid to say that, either. I just love the texture and the taste, and it never falls apart on me. It tastes very good “al dente,” which is how I like my pasta to be. 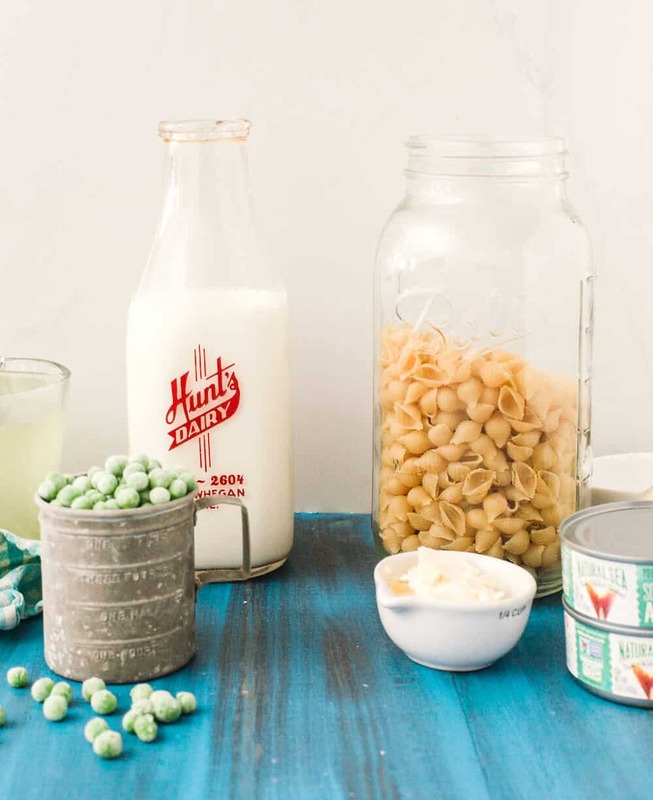 More on why it’s good for you: instead of using lots of heavy cream and cheese, this dish uses 1% milk and the absorption method – and a bit of light butter and cheese – to create a creamy sauce that’s lighter on fat and calories while still delicious and satisfying. 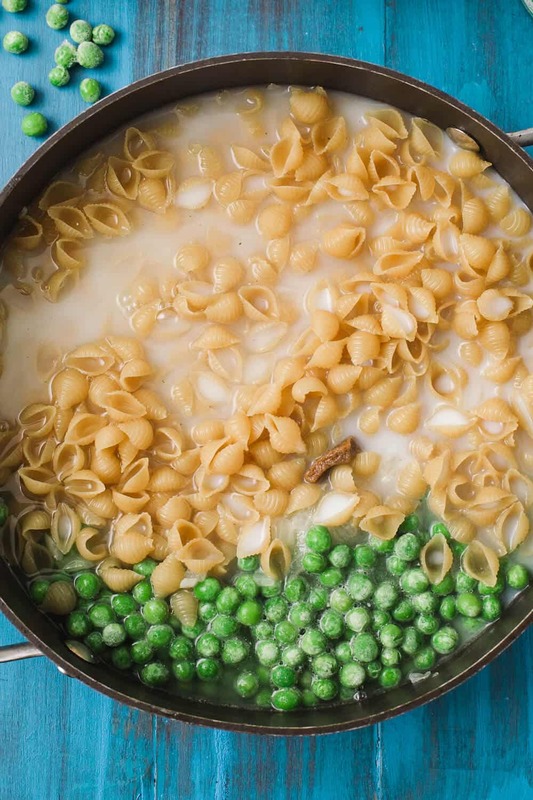 It takes less than 30 minutes to throw this together, making it a perfect weeknight meal. 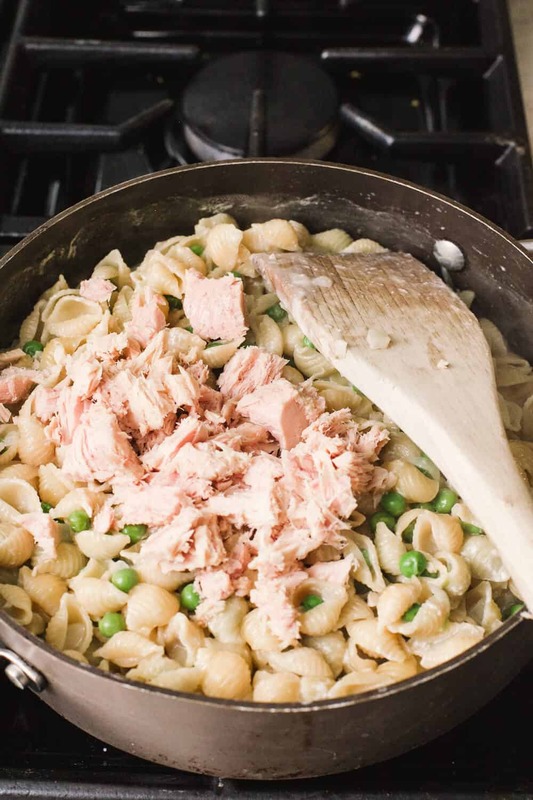 Your family is going to love this tuna pasta recipe, and they won’t even know that anything is “missing” from it (like fat and calories!). Heat the butter over medium high heat. Add the onions and cook until fragrant, then cook over low heat until translucent. 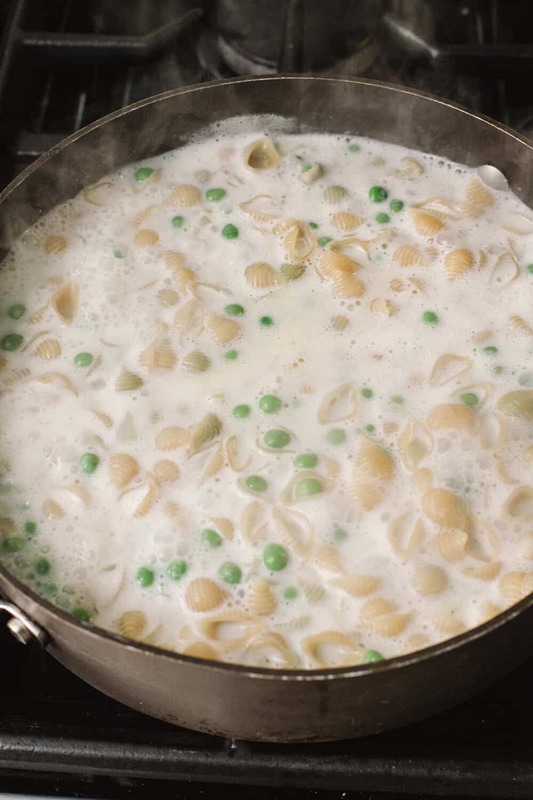 Add the pasta, peas, vegetable broth, and milk. 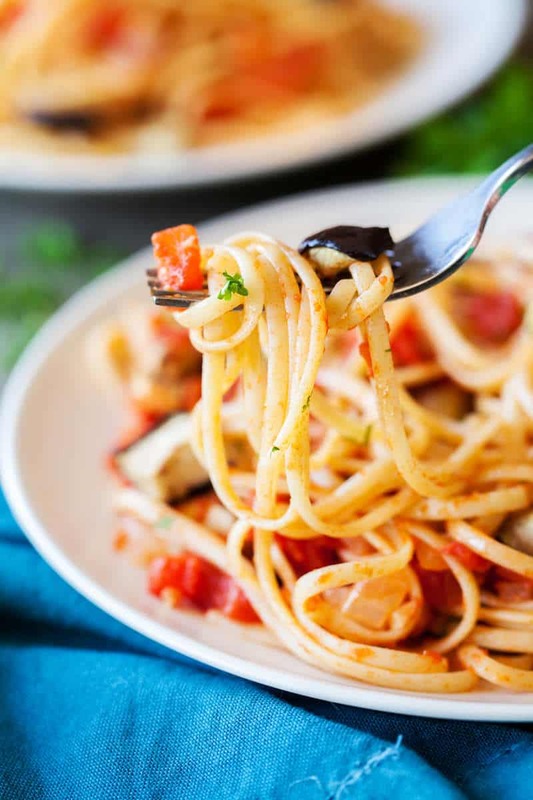 Cook for 20-22 minutes, stirring regularly, until the pasta is fully-cooked and the liquid has been absorbed to create a creamy sauce. If a little dry, add some more 1% milk. Stir in light jack cheese until melted, then gently toss through drained tuna, and season with salt and black pepper. 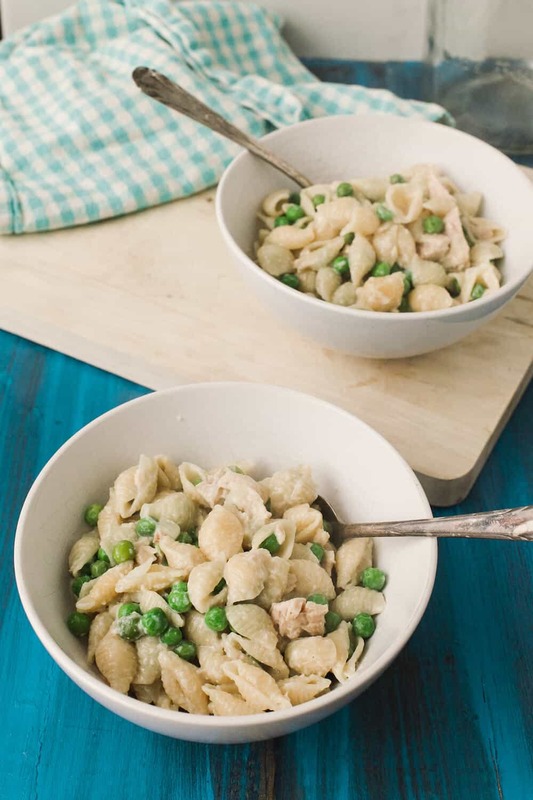 The whole family is going to love this tuna pasta recipe . . . I promise! Heat the butter over medium high heat. Add the onions and cook until fragrant, then cook over low heat until translucent. The list says Parmesan, the instructions say light jack cheese. Which one should I use?